CAMEROON, WEST AFRICA, 20 August, 2009 – Inspired by her experiences as a Peace Corps volunteer, Wendy Lee, of St. Charles, Missouri, is launching a major fundraising campaign to raise $11,500 to build 30 bilingual libraries in the West African country of Cameroon. Lee, a graduate of Saint Louis University, hopes to collect $5 donations from 2,300 individuals in order to make Books for Cameroon a reality. She is using the Peace Corps web site (http://tiny.cc/booksforcameroon) and promotion on Facebook, Twitter and her own blog (http://roundtwocameroon.blogspot.com) to garner support for the project. Lee contacted Books for Africa, an American organization dedicated to promoting literacy across the African continent. After receiving an all-or-nothing proposition for one container of 22,000 books, Lee joined forces with three other Peace Corps volunteers and the project quickly expanded to include 30 schools and communities across Cameroon. Libraries generally do not exist in Cameroonian schools, especially not in remote villages. And although some schools have one room with books, existing resources are underutilized. The Books for Cameroon project will not only supply books to create libraries. Lee and other Peace Corps volunteers will work in collaboration with RIDEV (Research Institute for Development), a Cameroonian organization, to provide library management training to ensure sustainability. Since Cameroon is a country striving for bilingualism, Lee’s Books for Cameroon project is seeking both English and French-language resources. Books for Africa will provide English language books as part of Phase I. In Phase II, the group will collaborate with two French organizations – Biblionef and l’AESCO (Aide à l’Équipement Scolaire et Culturel) – to provide French language books. The Books for Cameroon fundraising campaign is hosted through Peace Corps Partnership, a program within the Peace Corps that allows individuals to contribute to volunteer projects. For more information about Lee’s Books for Cameroon project or to make a contribution, please visit http://tiny.cc/booksforcameroon. CAMEROON, WEST AFRICA, 20 August, 2009 – Inspired by her experiences as a Peace Corps volunteer, Wendy Lee, of Saint Louis, Missouri, is launching an online fundraising campaign to raise $11,500 to build 30 bilingual libraries in the West African country of Cameroon. Lee hopes to collect $5 donations from 2,300 individuals using the Peace Corps web site (http://tiny.cc/booksforcameroon) and promotion on Facebook, Twitter and her own blog (http://roundtwocameroon.blogspot.com) to garner support for her Books for Cameroon project. When she began Books for Cameroon, Lee wanted to supply a four room school near her house with some books. She contacted Books for Africa, an American organization dedicated to promoting literacy across the African continent. 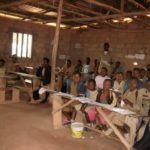 After receiving an all-or-nothing proposition for one container of 22,000 books, Lee joined forces with three other Peace Corps volunteers and the project quickly expanded to include 30 schools and communities across Cameroon.